Infiltration practices will be reimbursed at 75% of total costs with a maximum payment of $15,000.00 per parcel per year. When pre-treatment is required, the pre-treatment costs are included in the cost of the practice. Infiltration is a practice that captures, temporarily stores, and infiltrates the water quality volume over several days. The underdrain consists of a perforated pipe in a gravel layer installed along the bottom. Examples include gravel trenches or sodded area over an underground gravel bed or storage chambers with or without an underdrain. Infiltration practices typically treat larger drainage areas such as parking lots, multiple lots and/or commercial rooftops. 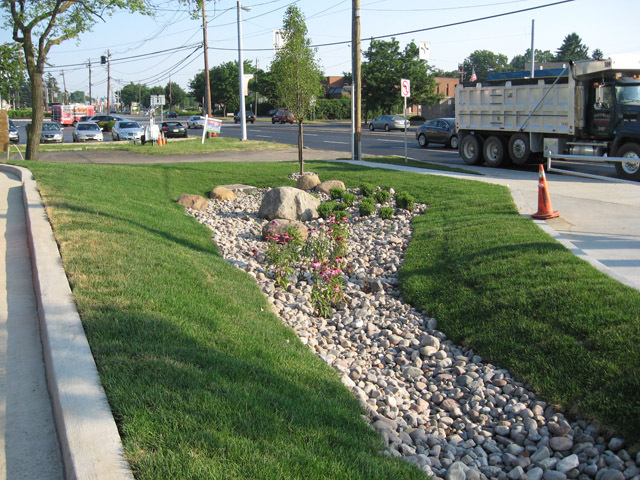 Infiltration should be located in common area or within drainage easements, to treat a combination of roadway and lot runoff. Infiltration used on individual residential lots is commonly referred to as a Dry Well.